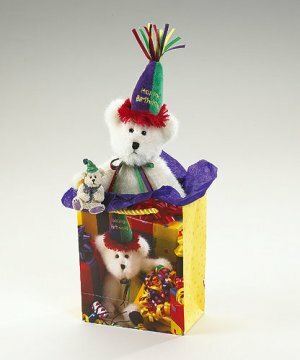 Boyd's :Lil Sumptin Gift Set, Issued for Spring 2006; Make Gift Givin' as easy as 1-2-3! Boyds Lil' Sumpthin' gift bags feature a miniature version of Happy B. Day; a coordinating, hand-decorated and ..
Boyd's :Lil Sumptin Gift Set, Issued for Spring 2006; Make Gift Givin' as easy as 1-2-3! Boyds Lil' Sumpthin' gift bags feature a miniature version of Happy B. Day; a coordinating, hand-decorated and super-detailed resin magnet, a quality gift bag with an original Boyds design featuring the plush critter in the set and matching tissue paper...all in one convenient package! Just put the paper in the gift bag, nestle in the plush friend and magnet and give...it's a great gift in just three easy steps!